EGW Marlin 1895, 336, 444 Scope Bases. Add the versatility of a one-piece Picatinny scope rail to your shotgun with no drilling or tapping. Precision machined from extruded aluminum with Picatinny slot-and-rail spacing that allows fast and simple changes to eye relief, plus great flexibility in scope choice. Drilled to fit the factory scope mount holes on the gun’s receiver. Accepts Picatinny or Weaver scope rings. 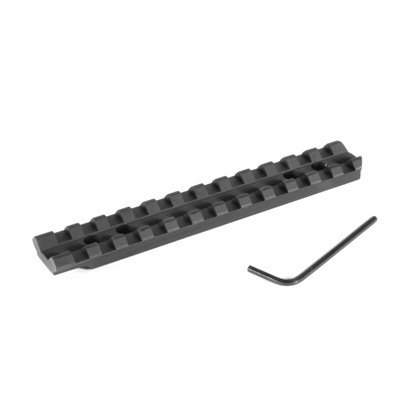 Lightweight Tactical mounts have a milled center channel for weight reduction. Full-width cross-slots are gauged to MIL-STD 1913 specs to +/-.002". Machined from ultra-rigid, extruded 6061 T6 aluminum. Includes socket head Torx® screws and wrench. EGW recommends 20 inch lbs of torque and a drip of blue loctite for mounting.